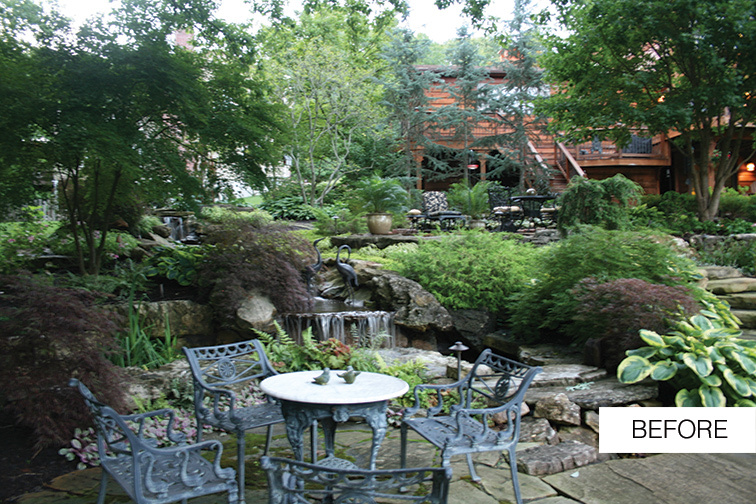 Landscaping and lightscaping take one lakefront yard from unusable to unforgettable in one hot summer. The Des Peres lake property suffered the occasional deluge from a nearby creek, and the back yard in general was a hodgepodge of undeveloped, unused spaces. After more than three decades there, the couple wanted an overhaul that would allow them to relax under the sun or the stars during the more temperate Midwestern days. “The shape of the lot slopes toward a lake behind our home and a wooded area, and we wanted it to blend together,” William says. 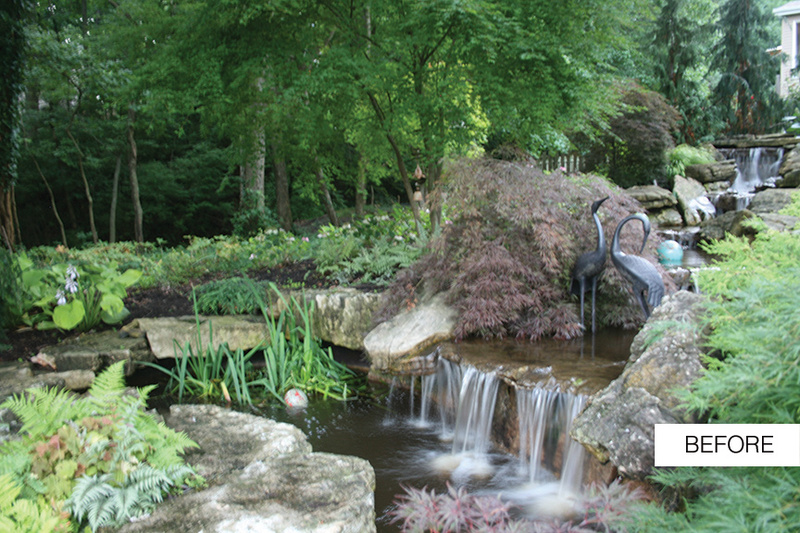 “It wasn’t getting utilized as much as we would like.” Over the blistering summer of 2012 when temperatures were routinely topping three digits, Frisella Nursery installed a pond, a pair of flagstone patios and a natural-looking rock waterfall that runs between them on the half-acre lot. But everyone knows a facelift is only half the battle—even good bone structure needs to find its best light. “All lighting is is a big illusion. 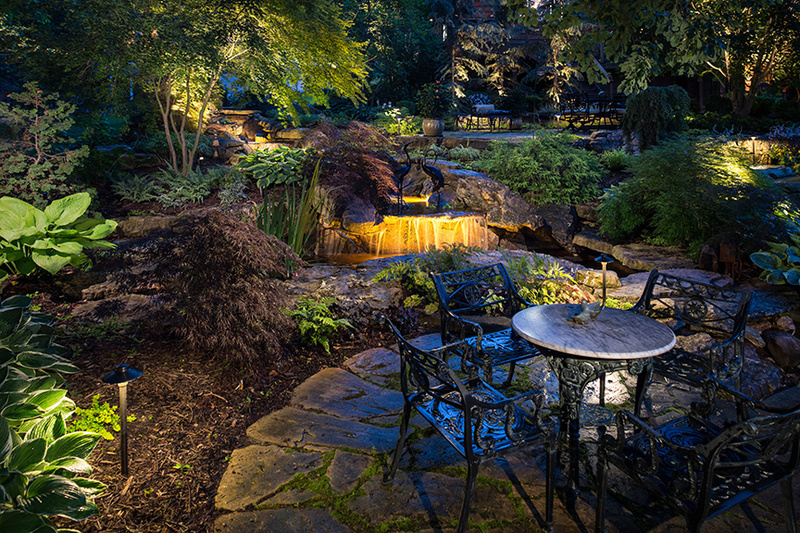 It’s a large space, and we made it feel two or three times bigger, but still like its own area,” says Tony Frisella of Frisella Outdoor Lighting. It was his team who came in to paint the natural canvas with light while the landscaping crew was still putting on its finishing touches. 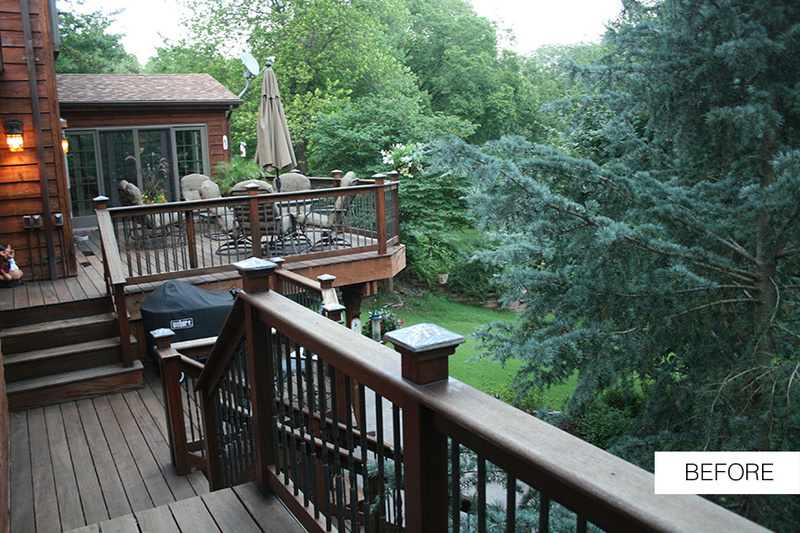 Tony incorporated long-lasting LEDs to illuminate the deck attached to the house, as well as the waterfall and foot path for safe passage through the yard. 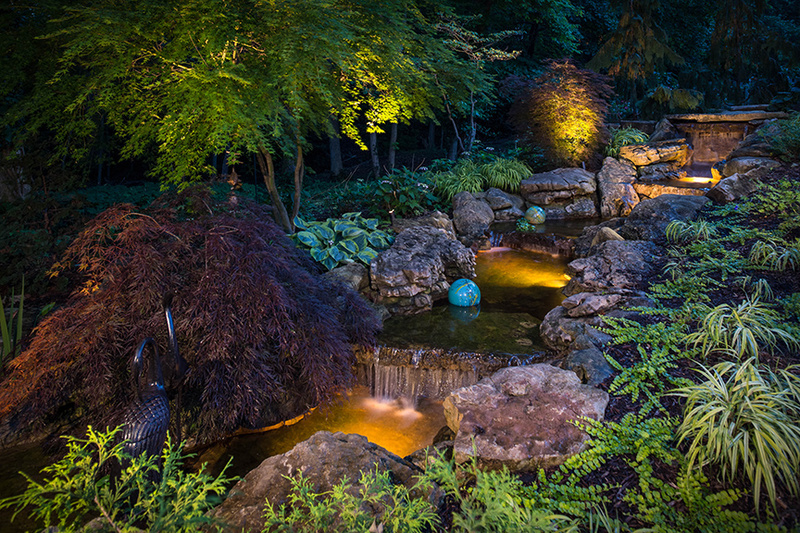 Next, he added dimension with lights on the pond and uplighting that showcase the pink leaves of the Japanese maples in the summer and the evergreens all year long. As a lighting designer, Tony was careful to eliminate large dark areas that can poison the ambiance. “It’s intimate and very, very functional,” he says. 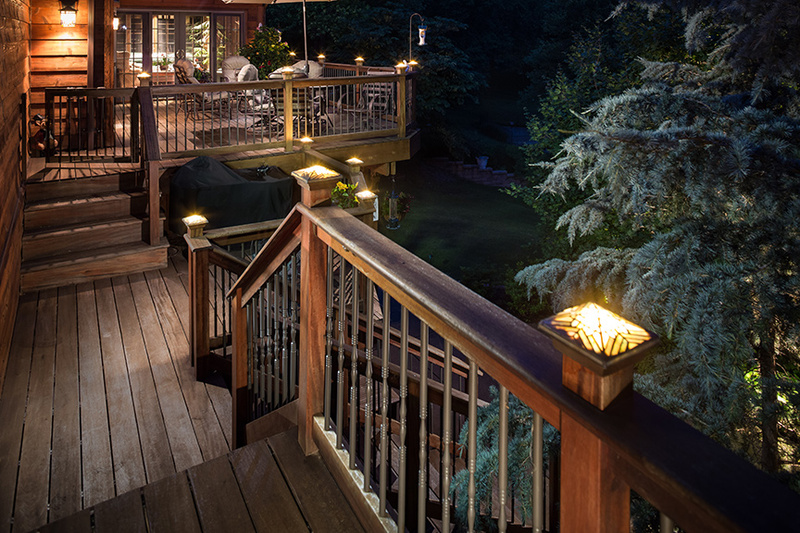 But the capper—literally—is the custom lighting on the couple’s deck. Made from exceptionally hard tigerwood, the deck material “must have gone through a hundred drill bits” during a trying installation, William says. The resulting stained-glass end caps that now grace the area provide just enough warm light to accent the space without being too stark. The renovation to the outdoor space has amped up the Reynolds’ appreciation for their surroundings and led them to their own suburban oasis.